It's not a single person that puts the Challenge together. This dedicated team gets together with a common goal and works as one to make it all come together. The Hoka Hey Board of Directors endeavors to make the event the most challenging it can be while also working to make it as safe as possible. The concept of the Hoka Hey Motorcycle Challenge came to Jim in the form of a dream—one thousand warriors riding one thousand horses charging into battle to defend the weak and innocent, to be a force that would bring justice to those wronged, and to stand in the gap between despair and hope. To say Jim Red Cloud, of the Lakota Nation, was controversial would be an understatement. Sometimes that controversy would be trust upon him through no fault of his own while other times he would boldly step into the fray to fight a battle he believed in; he was a force to be reckoned with. Another truth about Jim that cannot be denied was the size of his heart. He was compassionate about what he believed in and stood his ground when faced with an immovable obstacle. 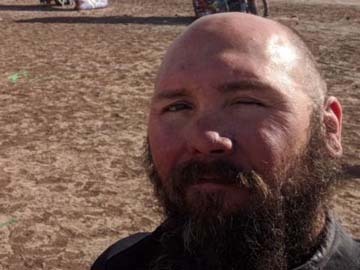 He portrayed this level of determination with regard to the Hoka Hey Motorcycle Challenge. He ensured the Challenge was not just another motorcycle event but rather formulated a concept that sharpened iron. He ensured any who participated in the Challenge would cross the finish line a better person; it was his guidance, direction, and support that made the Challenge what it is. By his actions he created a family that spans the globe and we are a better people because of it. He restored hope in those who needed it and gave us all a venue whereby we could accept a responsibility, accept a determination, and accept a courage we did not know we possessed. To any who participated in the Challenge Jim was more than just the event organizer; he was a friend, a brother, and a mentor and he gave a piece of himself to all who knew him. Jim is gone but that piece of him that lives in all who knew him drives us; we take that responsibility seriously. I was born in Ft. Sill, OK and was not only an “Army Brat” but a “Preacher’s Kid” and finally a “Shrink’s Daughter!” Some might think this meant I was nothing but trouble my whole life but, what it really means is that I am “STRONG!" I started riding motorcycles when I was 16 years old and have either been in the saddle or on the back ever since. I met the love of my life, Jim Red Cloud, when I was just 19 years old and the two of us made a great team. Through the years, we owned several businesses, along with real estate investments and other ventures. Jim and I are both proud Navy veterans; he served from ’73 to ’75 and I served from ’92 to ’98. Jim was also an artist and created some truly amazing pieces of work. His creativity and drive knew no bounds and it brought us many amazing things and took us to many amazing places in our life together. Still, there are very few things that we did together that could rival the creation and promotion of the Hoka Hey Motorcycle Challenge. This event is the result of Jim’s inspiration and my determination. I've always known that hard work and perseverance is necessary in order to get by in this world and the HHMC has demanded that of both it’s riders as well as its founders!! Since Jim passed away this last summer, I have had to rely on every ounce of strength and determination I could muster. Still, in my weaker moments, it has been my family – both my biological family and my Hoka Hey family – that has carried me through. I was born and raised in Bethlehem, Pennsylvania and moved to California many years ago. 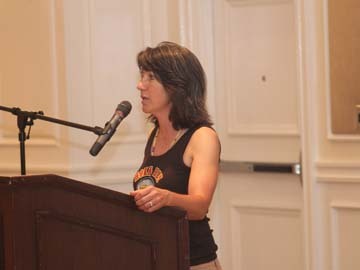 I just happened to be one of the lucky people who met Beth and Jim long ago through other people in the motorcycle community. Being part of The Hoka Hey Motorcycle Challenge from its inception has been such a great privileged. Every story from the thousands and thousand of miles our riders have traveled are etched in my heart and I treasure the wonderfully amazing people Hoka Hey has brought into my life. My favorite place during a Challenge will always be the finish line and I look forward to continuing to watch our Hoka Hey family grow. 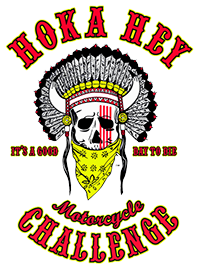 Many of you already know me from the years I have spent riding the Hoka Hey Motorcycle Challenge and many are getting to know me through the challenge. As the director of rider relations I am one of the first people you meet when signing up because I do your entry interview. Once we determine whether we are a good fit for your riding experience and passion for others we go from there. My job as the interviewer is to determine, as best as I can from a phone conversation, if you understand what is asked of you. I absolutely LOVE to ride motorcycles. 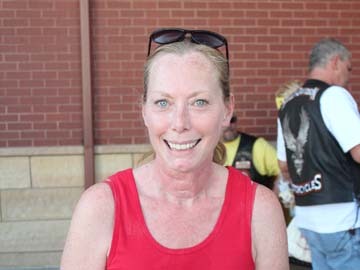 I love the people I meet on the road and at motorcycle events. Riding in the dirt as a kid in Illinois is were I had my first riding experience and from there occasionally road but did not get real serious until my kids were older. My first Harley was a 2006 Smoky Gold and Black Fatboy. I went in for boots and came out with a bike. From there I started taking trips on the bike usually with one of my kids on the back. 10 miles of dirt roads in the dark in North Dakota heading for Saskatchewan was my first encounter with what I would call tough roads. My daughter and I were following a challenge Harley Davidson had put out to earn a commemorative pin. It required you to ride from Sturgis to Saskatoon. I got the pin! Although I am on the board I do not look at the route prior to the event because for me that would be like unwrapping a Christmas present before Christmas. Riding the event is my favorite part of the HHMC but a close second is the new family I have married into and of course fund raising. From the first riders meeting when I heard Jim Red Cloud speak from his heart about the Lakota People he pricked my heart to help. Another of my jobs as the director of rider relations is to encourage and direct the riders in their fund raising efforts. I love my job and although it is a volunteer position I feel like a CEO! I get to hear the road stories and write the Meet the Rider biographies you are reading. This allows me to share some of my road experience and what it has been like to be one of those five Warriors who has ridden all the HHMC routes. I look forward to seeing what the road has in store for us and seeing the finish line a little sooner than I did in 2016. 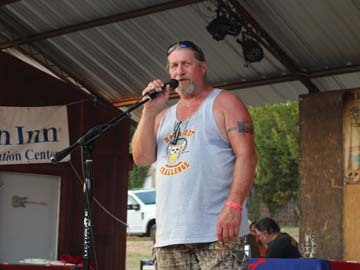 I learned of the HHMC through my old Game Warden partner Bubba Vincent, also a HHMC Rider. I was living in Hawaii in 2010 when the first challenge took place. Bubba called me and told me he had found us a new adventure to try, but I was in the motion of moving back to Texas and didn't have time to get prepared. 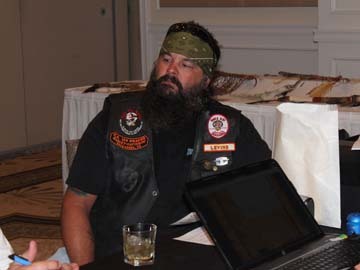 So I told Bubba, who rode in 2010, that if he liked it then I would ride in 2011. He did and so in 2011 I made my first HHMC, which just happened to be the longest challenge they've had. Starting at Mesa, Arizona, riding to the Pacific Coast, through the 48 Continental US States, Gulf of Mexico, up the Atlantic Seaboard to Nova Scotia. And what a Ride it was - from the time I left home and returned home on my 2011HD Ultra Classic, I put in 19,087 miles in 22 days of riding. The adventure was the most demanding challenge I have ever put myself through. From the heat of Death Valley, 120 degrees at midnight, to 16 degrees a top Bear Tooth Pass, along with rain from Hurricane Irene, sleet, hail, wind, earthquake in North Carolina, lack of sleep and living on protein bars and jerky I fit myself into a pair of jeans two sizes smaller and 28 lbs lighter once I reached the finish line at Cape Britain , Nova Scotia. Since that ride in 2011 I have been with HHMC ever since ....after meeting Jim Red Cloud and his wife Beth, and being asked by Jim to come work with them, I have been a part of the Greatest Long Distance Family ever born-the HOKA HEY OYATE'S!!! One of the great things about riding the challenges is the family you make with the other riders. We're all definitely different in our own ways, but our cravings for adventure are the same. We've been described as misfits and dysfunctional -and yes to a point we are - but we're all Warriors , Warriors who fight for the weak, helpless, injured, needy, disadvantaged and anyone else who ask for our help. I have done nothing but grown by being a part of this Tribe over the past eight years and I'm proud to know that I'm a Hoka Hey Warrior !!! HOKA HEY !!! My advice to any new rider riding the challenge - "Expect the Unexpected" - "Sleep when you feel the need" - "stay alert" - "and, they're all kinds of creatures that will join you on a HHMC?" Eric, from Panama City Beach, Florida, is an experienced Challenger with the 2012 and 2014 Hoka Hey Motorcycle Challenges under his belt. He first learned about the event after reading about it in Full Throttle Magazine. The finish line was his most memorable moment of each of the rides. He felt like he pushed himself to get there and finds it very rewarding. It gave him the confidence he lacked to get out on his own and ride. 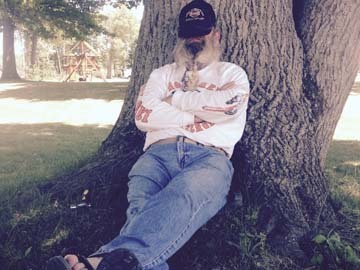 He says, “Now I’m a guy who can go out into the world by myself.” In the 2014 HHMC, his riding partner, John Levins # 735, was injured in Canada and Eric was required to go on by himself. Getting to Alaska really boosted his confidence. One of his scariest experiences was waking up to a police officer and a drawn gun in his face. Once the officer was satisfied with his explanation, Eric was allowed to go back to sleep. By then he was wide awake and rode on. Smelling the breath of a moose in the Rockies and riding through Glacier National Park in Montana are two of many exceptional moments Eric experienced. Through the rides in 2012 & 2014, Eric learned how much he had missed in the past when travelling by interstates. Since his first Hoka Hey Motorcycle Challenge in 2012, he enjoys the twisties and back roads at every opportunity. Eric joined the HHMC board of directors in 2017. He plans on supporting Panama City Beach Paws and Claws during his 2018 ride. Father of Abigail Jane Levins and motorcycle enthusiast. I also serve as risk management officer on the board of the Hoka Hey Motorcycle Challenge. My Hoka Hey family journey started in 2012. The same year I lost my Father. August 5th I found myself on the starting line of the 3rd Annual HHMC in sunny Las Vegas, Nevada. Just three months after my Father's passing and boy did I need this escape from reality. Standing by my side was my brother from another mother Eric Buskell rider # 733. We have been friends for over 30 yrs. This morning would change my life forever. We would be riding for 13 days nonstop. Over those 13 days I had quite a few deep spiritual events. The Hoka Hey family has become my family. 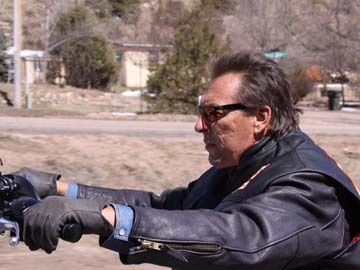 Jim Red Cloud took me as his son after I lost my biological father. He said I was one of the lost boys. The passing of Big Jim Red Cloud was very hard for me because I feel like I have lost two fathers. He was a great mentor, brother, and Father. I rode my first bike around the age of 15 and at 17 joined the U.S. Army; been doing them both ever since. I learned of the Challenge in 2010 but it wasn't until 2013 I was able to pit myself against the Challenge. I could write a book about what the 2013 Challenge did for me... wait, I did write a book about it. "Solitary - Without the Confinement" was published in 2015 and went on to not be on the New York's Best Seller list. Shortly after the 2013 Challenge I was asked to be a member of the Board of Directors and I quickly accepted that role. I am the creator of the route, I'm the guy you love to hate every day while on the road. Awareness, enrich, inspire, empower, unite, and create an army are only words if you are not willing to live it.